As technology has evolved, so has the refrigeration industry. What were once holes in the ground filled with ice and snow have transformed into the modern high-efficiency compression machinery we have become so familiar with today. However, as common as these devices have become, the design process remains a challenge. This is where a combination of scientific knowledge, experience and creative initiative comes into play. While there are, of course, several variations in terms of the application of each design step, the guidelines presented here could be applied not only to refrigeration compressors, but also to compressors used in many other processes and industries. 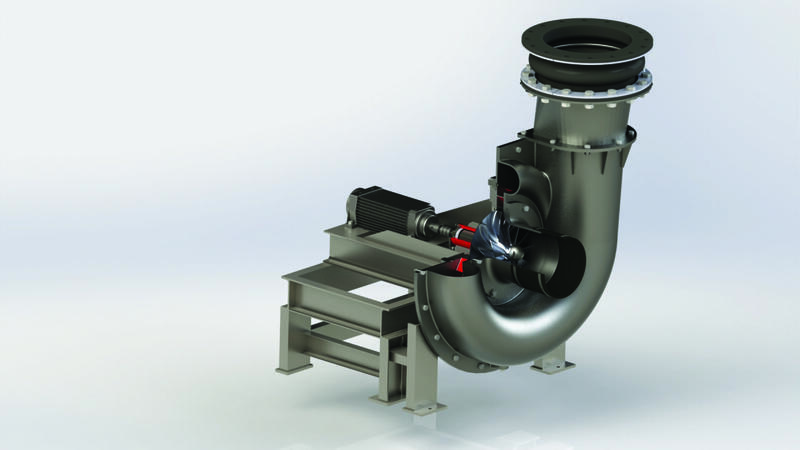 There are a number of steps to consider throughout the compressor design process, and each step has to relate back to the original design concept. Experience has shown that having a starting concept and an end goal in mind is imperative. Namely, before you can begin the process, you need to know where you are starting and where you want to end up. With this in mind, before we can even get started with preliminary design, blade profiling and analysis of computational fluid dynamics (CFD), it is important to take out a piece of paper and start brainstorming. Consideration of the different refrigeration technologies (cycles), is always a great place to start, so we can ensure we will design the best compressor for the application. The cycle will directly impact the rest of the compressor design decisions, so this is not a step that can be bypassed. This article’s discussion begins with cyclic compression. Cyclic refrigeration units are used for reducing and maintaining the temperature of a body below the general temperature of its surroundings. In a refrigerator, heat is pumped from a low-temperature heat source to high-temperature surroundings. According to the second law of thermodynamics, this process can only be performed with some aid of external work. The vapor-compression refrigeration cycle (which is a type of cyclic refrigeration) is used in most household refrigerators, as well as in many large industrial systems. The advantages of choosing this route are that the technology is mature, the costs are relatively low and the process has the capacity to be driven directly with electrical or mechanical energy. For initial consideration of the compressor, we must perform calculations to determine the operating conditions and system function, the type of working fluids and the system size and requirements, as well as the economic analysis of the whole cycle. By completing these steps prior to beginning the preliminary design, we are establishing boundary conditions, performance requirements and geometric constraints for the compressor before committing to a design that may or may not be realistic. Next, we must determine the type of compressor we want to use for the refrigeration cycle. For the purposes of this article, we will focus on the centrifugal configuration (Figure 1). However, many other options exist, including reciprocating, scroll, helical and rotary compressors. To elaborate on the output from cycle calculations, we also need to know several specific data points for the proposed compressor, including the required pressure ratio, discharge pressure, volumetric flowrate of the refrigerant, application requirements and the assumed required economics. At this stage, the procedure feels much more like science than art. Next, the designers need to decide whether they want to design a compressor using an existing similar design (requiring them to scale up or down and optimize the design) or to start from scratch with something completely new. For the purposes of this article, let’s focus on a new design. Now that these decisions have been made, let’s revisit that piece of paper from the brainstorming session and launch into the design process to make the project a reality. The compressor itself is just a part (albeit very important part) of a cooling system. It’s the proven combination of components coupled with sound engineering, assembly, piping, packaging and controls (I&C) that comprises the end-product’s value. There are many cooling compressor manufacturers, but how many have supplied turn-key containerized units for installation with -55C specs above?